Some time ago I realized that leading a health conscious lifestyle today will affect my health in later years. I returned to regular exercise and my wife made sure we consumed a healthy diet. Future health care costs are affected by today’s lifestyle. Since I have felt a responsibility to my clients, I realized the need to become a Wellness Facilitator during the next decade of my work. Adopting “result oriented” wellness progarms will be recognized as a productive way to reduce future health insurance costs. 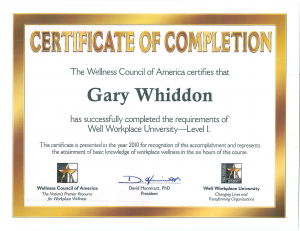 To truly help employers, I felt the need to learn as much as possible about implementing and managing workplace wellness. WELCOA University provides three levels of wellness certification, and is recognized as the place for wellness education. Level 1 is now completed and I am pursuing Level 2. If you have any questions about wellness or would like to set up a wellness program for your firm, please call me at (888) 474-6627 x116.